A Rolleiflex 2.8 FX similar to the one bought by Michael to kick-start his film photography. How ironic to me that Michael Reichmann of all people has now decided that he's been missing something during his time with digital photography and wants some film back in his life. It was Michael who got me into digital photography in the first place through his review of the Minolta A2 camera about a hundred years ago. I progressed quite quickly through the Pentax K10D and then the Nikon D700 before realising about four years ago that it didn't matter what digital camera I used I'd never get the satisfaction from pixel photography that I derived from good old film and darkroom. That's when I decided to ditch digital and follow my heart. "As the days pass, I realise something profound. I really miss the craft side of photography. I miss getting my hands wet. I miss loading a Nikor reel in the dark. I miss seeing an image slowly appear under a safelight, as if by magic. "Yes, I have mastered digital. I've been using Lightroom since it was code-named Shadowland and have been a long-time beta tester for Adobe. I have produced countless training videos and dozens of articles on digital image processing over the past 15 years or so. "But I was also a competent colour and B&W darkroom worker and teacher for many decades and I've recently come to the realisation that I miss it. The whole messy, smell thing. "Once I returned home, I realised that I had to actualise my thoughts. I needed to return to doing film-based photography (at least some of the time) and it was high time that I fulfilled my desire to own an f2.8 Rolleiflex TLR." That's exactly why I gave up digital - the "craft" side of digital just doesn't do it for me. I don't have Michael's experience with Lightroom but I've been using Photoshop for about 20 years, digitising negatives through scanning before moving onto digital cameras. It just leaves me cold when compared with darkroom work. Michael's comments are encouraging because his Luminous Landscape website gets a lot of traffic and he's influential - infinitely more so than I am anyway. "The lowest acceptable ISO for medium format (my bold) is, to my mind, ISO 100. I shot several rolls of ISO 400 B&W negative and colour negative and while it once (obviously) met my standard in terms of grain and resolution, it no longer does. "As for 35mm, as far as I'm concerned 135 film is simply not competitive at all against any digital camera. If you like it, fine, but history has moved on." He also said he won't be doing darkroom printing but will be scanning his negs and printing them out on an inkjet. That's a pity and I hope he feels sufficiently inspired to get some sort of darkroom set up even though he says he lacks the space. Come on Michael - go the whole hog! You said you miss seeing the image appearing under a safelight, well the answer isn't difficult to figure out! Digital also seems to have affected the way he views film. Michael seems to only find film acceptable when it mimics the qualities he gets from pixel-based imaging. The tiniest bit of grain is now no longer permissible. I'm not sure how you can mention the character of film but complain that it's not as smooth and grain-free as digital! Michael runs one of the most successful photography websites in the world and doesn't seem short of a bob or two. Why not open The Michael Reichmann Community Darkroom in your city (Toronto? ), get your own hands wet and teach other people how to get theirs wet? Or host residential darkroom courses which I'm sure you'd be excellent at. The thing about Michael is he's not only a great communicator but he's a bloody good photographer as well. I might be reading too much into his final paragraph when he says that all the images in his article are digital because, "…I have not yet done enough good work with the Rollei to publish any (film images)." I wonder if Michael is finding his hit rate lower with the Rolleiflex. Having just 12 shots instead of thousands can take a bit of getting used to. It was also interesting to read that he chose a new Rolleiflex FX with the f2.8 Planar for his return to film photography. By sheer coincidence, I'll be posting about my own Rolleiflex 2.8F this week and why I think it's the best camera ever. Spooky, eh? Could there be any better camera to return to classic photography? I miss my 2.8F sometimes too and was thinking of selling my Hasselblad to buy one. I disagree about 35mm though. At least when printing on paper 35mm is absolutely fine, and looks stunning in B&W up to about 16 x 20 which is about as large as I ever need to print. Sounds very familiar. I got back into photography after almost 30 years away and went digital upon my return. After a bit I missed the darkroom bug which bit me when I was 8 years old. I went back to film, developing myself, and printing. I then stepped up to MF and now have all the cameras that I always wanted to shoot with; Hasselblad SWC/M, Rolleiflex 2.8C Planar, and several Leicas. Thanks to digital I can now afford to shoot with these cameras. I even picked up a Focomat IIc several years ago for $500! I've been rescuing darkrooms from the scrap heap and then finding people to take them. I will be teaching some darkroom skills to a friend here in Houston tonight. Feels right! A Focomat IIC, Gary? I've got one of them on my wish list but have never seen one for sale within a reasonable drive of my house. I'm going to keep looking though. I envy you guys who can print 35mm at 16x20. My technique is only good for around 12x8 (which is big enough for me anyway to be honest). ! I keep meaning to get my sharpest lens, Adox CMS 20 film and a tripod and see how far I can go. At 8x10 I cant see any grain with modern Tri-x... I learnt a few years back from going to photo exhibitions and seeing prints from some of the greats at 12x16 and 16x20 that they can look really really good. Bruce, another favourite is to print MF Hasselblad images small at say 5x5" with a large passepartout. I love that look as well. Bill Schwab and Michael Kenna sell a lot of prints like that. Yes, it was Michael Kenna who inspired me to try myself a few years ago... Love that Bill Schwab print!! Interesting quote from Eric Labastida, kind of sums up how I feel also. "Why did they feel a need to change something that wasn’t broken to begin with? Film has a look, feel and soul that digital will never have, period. When I start to talk about digital and how it has infected photography I think, “digital photography– that’s really an oxymoron”. Whenever I pick up a digital camera I feel like I’m using a toy not a tool. If they stop making film in my lifetime I’ll just take up charcoal sketching or something. Digital photography is too easy, and when this technology was delivered to the masses it immensely dumbed-down the medium to the point where “a chimpanzee can use it”, as Elliot Erwitt would say." Wow...first time I see the work of Eric Labastida and I love it! Eric also has a blog; don't miss the link at the bottom of the interview. Thanks for bringing him and his work to my attention. Antonio - with regard to that quote, Chimps were using film too - you just have to look at the plethora of P&S and auto-everything SLRs, but what the Chimps can do with digital is make far more mess and then decide which bits of the mess they don't want . . it's helped everyone have a reasonable stab at making a technically spot-on picture, but sadly it hasn't helped them with composition. Strangely (to me) I've just become a chimp too and bought a DSLR - it's a vastly complex piece of machinery with tons of crap that gets in the way of taking photographs, so I've switched all that off - it's primarily to make colour 'files' with and then print them. But with regard to Rolleis, a complex and yet utterly simple camera - life was much less complicated when it was just me and my T.
I read the essay with some bemusement really, this is the guy who found a 3mp D30 to be superior to 35mm and almost as good as 6x7 in 2001. Its a shame he didn't show a few images he has taken with the camera, the ones in the article suffered from the digital mono look I'd have rather seen his 'not good enough' work on the Rollei than the mainly substandard digi mono images (lacking in tone and compressed) he took in Cuba. I don't see any grain at all on 12x16 from Acros or Tmax from 6x6 and barely detectable with some 400 speed, so either he is looking at aliasing(digital false grain) or just screen based and seeing artefacts--very strange. All in all interesting because after some time of use he will find his Rolleiflex a great picture making machine and one that won't place a barrier between his face and subjects which will humanise his photography. One he gets over the laterally inversed finder and gets himself a Rolleinar for close work I think he'll be surprised. 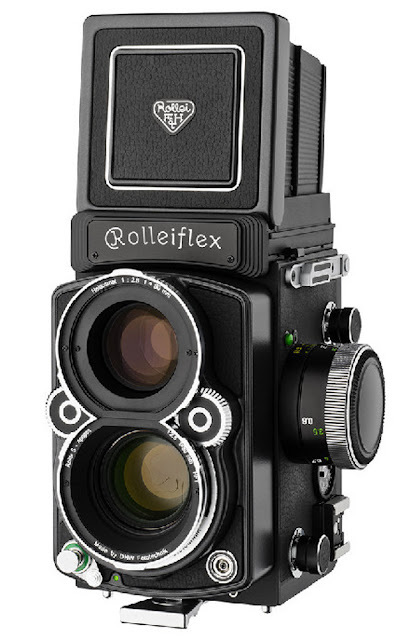 Re Rolleiflex: I'll be posting an article tomorrow with almost exactly the same title as your opinion of it. No question that medium format gives great results, but for: "As for 35mm, as far as I'm concerned 135 film is simply not competitive at all against any digital camera. If you like it, fine, but history has moved on." I just don't think he is looking for the same things I'm looking for. I still like the tones of 35mm and the colors of 35mm: especially, Tmax100 and Porta 160. Maybe history has moved on for him getting poor B&W quality and horrible skin tones, but for me it is still with 35mm. Even if his version of competiveness is not. Perhaps, when discussing the appearance of grain in prints, we should remember that the image must go through two optical systems. The nature of the enlarger light source affects the visibility of grain and a first-class enlarging lens will make it more noticeable. A properly adjusted grain magnifier, flat film and a rigid column will conspire to make grain more visible. Even moving your feet during exposure on an old wooden floor can affect sharpness. It's possible that people who see no grain are simply not resolving it on the print. I wonder if a few threads or contributions on enlargers and enlarging might be interesting to readers. Some darkroom talk on the Online Darkroom? I print both large and small as mentioned above. On the following image the grain is barely noticeable (and you have to push your face right up to the print to see it), and is very pretty anyway. I actually prefer the look of the first image overall. Both were printed on a Magnifax 4a with Rodagon 80/4 and a stable floor! The first image was taken handheld with a 500CM/80CF and the second from a tripod with a 500CM/CFE. It's possible that people who see no grain are simply not resolving it on the print. That doesn't sound very likely, while its true that some condenser enlargers pick out grain and diffusers attenuate it slightly you'd have to have really bad technique to find grain on an A3 sized print from 100 ISO films like Acros or Tmax even on 35mm let alone 120.
n.b Mr R is only scanning and if you want the real reason he sees so much grain its due to his poor workflow, scanner aliasing and on screen viewing. Nice article, but then again Michael Reichmann probably makes money in some way from his reviews and there is a lot more money in reviewing the latest new thing being marketed than tried and true technology. As long as companies still make film and there are ways to get it processed whether Michael Reichmann and the general public agrees with it or not should not effect what we do and enjoy. The only real danger of digital, other than people losing the understanding of shutter speed, aperture, and composition, is if the market demand is so low that no one makes film anymore. Hopefully that will not happen. Nice article and comments. It would be good if we could get a film manufacturer to make a film that is designed for scanning.